See also: Cherry Point Marine Corps Air Station. Camp Lejeune, near Jacksonville, home of the Second Marine Expeditionary Force, was established just before the United States entered World War II. The installation was named in December 1942 in honor of Gen. John Archer Lejeune, who had died a month earlier. Lejeune was the first Marine Corps officer to lead a U.S. Army division (during World War I) and commander of the Marine Corps in the 1920s. The site, chosen in the 1930s for an East Coast fleet Marine Corps headquarters and training facility in anticipation of a war with Germany and Japan, was on the New River in Onslow County close to the Marine Air Station at Cherry Point and accessible to two deepwater ports: Morehead City and Wilmington. The process of acquiring the rights to 174 square miles (111,155 acres), including 11 miles of beachfront, meant displacing 720 families-a total of more than 2,400 persons-and delayed the beginning of the camp's construction until April 1941. The following month Lt. Col. W. P. T. Hill assumed command of the base, originally named Marine Barracks, New River. A converted beach cottage served as his headquarters, and the most imposing structure on the base was a large tobacco barn that the marines used as a warehouse. When the First Marine Division, under Brig. Gen. Philip H. Torrey, arrived at New River in September 1941, tents were the only quarters available for the troops, although by then 8,000 civilian workers were toiling seven days a week to build permanent barracks and other facilities. Camp Lejeune Railroad, also named in December 1942, began operations in 1941 to meet immediate requirements for a track connecting the new base with the Atlantic Coast Line Railroad in Jacksonville. 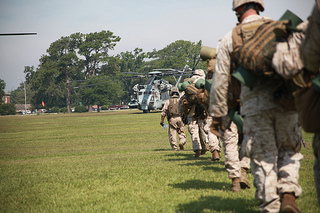 Within 60 days, an eight-mile section between the camp and Jacksonville was hauling materials for the facility's construction and supplies for the marines, as well as providing access to both the Wilmington port and the Marine Corps Air Station at Cherry Point. From Havelock, where the Cherry Point station was located, the railroad cars from Camp Lejeune could continue to Morehead City on the tracks of the Atlantic & Eastern North Carolina Railroad. The Cherry Point branch, with its sidings, switches, and yards, was fully operational by 2 Dec. 1943. During World War II thousands of marines began their journey from North Carolina to the battlefront on the Camp Lejeune Railroad. Camp Lejeune provided a broad range of instruction, excepting only general recruit and officer training. Thousands of new marines, fresh from boot camp, arrived to attend infantry school. In 1942 the Marine Corps Engineering School moved from Quantico, Va., to the base and established the Marine Corps Service Support Schools. A year later the Field Medical Service School and the Naval Hospital began to operate there. Lejeune was the only facility that offered recruit and officer training for women marines and the only recruit depot and training center for African American marines (at Montford Point Camp, established in the summer of 1942). Before the war ended, Peterfield Point (later Marine Corps Air Station New River) had been commissioned. Although some of these schools and Peterfield Point were decommissioned immediately after the war, all were eventually reestablished at Lejeune, most of them during the Korean War. The Second Marine Division, formed in 1941, endured some of the deadliest combat of World War II, fighting at Guadalcanal, Tarawa, Tinian, and Okinawa. At the end of the war, after a short stay in Japan as part of the U.S. occupying force, the division made Camp Lejeune its permanent home. 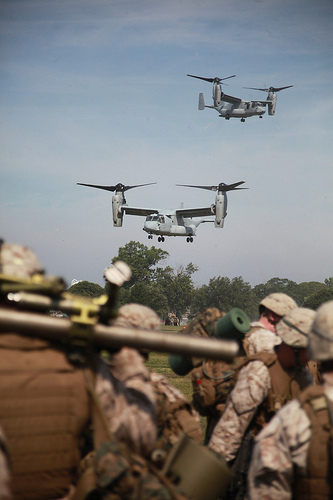 Along with the Second Marine Aircraft Wing, the Second Force Service Support Group, and the Second Surveillance, Reconnaissance, and Intelligence Group, it constituted the Second Marine Expeditionary Force. By the early 2000s Camp Lejeune, expanded to 233 square miles (151,000 acres) with 450 miles of paved roads, 50 miles of sidewalks, and 6,946 buildings, accommodated the largest single contingent of marines and sailors in the world. More than 43,000 marines were assigned to the camp, and almost 5,000 civilians worked on the base. In addition to the Second Marine Expeditionary Force, Camp Lejeune was home to the Second Marine Expeditionary Brigade and the Fourth Marine Expeditionary Brigade (Anti-Terrorism), which was reactivated in September 2001. The 22nd, 24th, and 26th Marine Expeditionary Units were also based there. Camp Lejeune marines continued to serve in U.S. conflicts, including Operation Iraqi Freedom (begun in March 2003). Gertrude S. Carraway, Camp Lejeune Leathernecks: Camp Lejeune, N.C., Marine Corps' Largest All-Purpose Base (1946). Tucker R. Littleton, "A Civilian History of the Camp Lejeune Area from Earliest Settlement to 1941," Archaeological and Historical Survey of U.S.M.C. Base Camp Lejeune, vol. 2 (1981). Marine Corps Base Camp Lejeune, N.C., Operation Mailed Fist, June 18. For many of the Marines involved in the Marine Air Ground Task Force it was their first time riding the CH-53E, Super Stallion. Image courtesy of Flickr user CherryPoint. Available from http://www.flickr.com/photos/mcas_cherry_point/7401013450/ (accessed August 30, 2012). Marine Corps Base Camp Lejeune, N.C., Operation Mailed Fist, June 18. Image courtesy of Flickr user CherryPoint. Available from http://www.flickr.com/photos/mcas_cherry_point/7400998756/ (accessed August 30, 2012). 1 January 2006 | Farnham, Thomas J.